Establishing prognosis in individual coronary heart disease patients is difficult because of the complex pathophysiologic interactions inherent to the disease procers. This difficulty applies as much to specific prognostic information derived from electrocardiography as it does to any other clinical or laboratory method of evaluation. 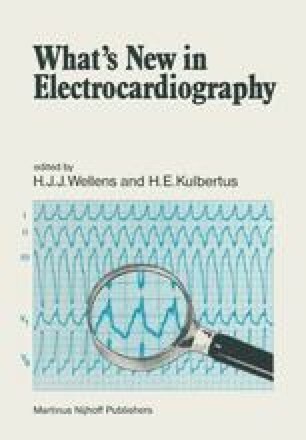 While electrocardiography alone, during and after myocardial infarction, has limitations primarily related to the dynamic characteristics of evolving and healing infarction, there are, nonetheless, valuable prognostic clues which can be recognized. As long as the clinician recognizes the limitations, the electrocardiogram in conjunction with other clinical information does have distinct value both for general and for specific prognostic indices. In this chapter, we summarize the electrocardiographic indices for establishing prognosis in patients with ischemic heart disease, with particular emphasis on myocardial infarction. We analyze available information in three clinical settings: (a) during the acute phase of myocardial infarction, (b) during the convalescent (late hospital) and early posthospital phase, and (c) during the phase of stable ischemic heart disease after surviving myocardial infarction.